The phantom provides a good representation of breast tissue, thereby making it close to a real-life learning experience. The automated stereotactic breast biopsy procedure depends on several variables for accurate needle placement. Use of the Model 164A provides technologists and physicians with the training needed to be confident in performing stereotactic procedures. The phantom provides a good representation of breast tissue, thereby making it close to a real-life learning experience. the accuracy of the biopsy system and the operator. Construction . . . . Gel with attenuation properties similar to breast tissue. Stereotactic Breast Biopsy Phantom Model 164A The phantom provides a good representation of breast tissue, thereby making it close to a real-life learning experience. The automated stereotactic breast biopsy procedure depends on several variables for accurate needle placement. Use of the Gammex 164A provides technologists and physicians with the training needed to be confident in performing stereotactic procedures. The phantom is made of a clear gel encased in a soft vinyl for easy compression and a skin-like resistance to needle insertion. 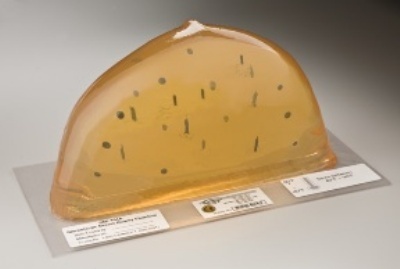 Embedded in the gel are 20 to 25 radiopaque lesions ranging in size from 2 to 5 mm. The 3 and 5 mm gel lesions are used for practicing core biopsies and the 2 mm liquid lesions allow for the practice of fine needle aspiration and tests the accuracy of the biopsy system and the operator.